I am constantly on a quest to fulfill my husband desire for low nutrient density carby foods. Baked Ziti, sandwiches of every kind, Chinese Food with rice, etc. So, I asked him what food he missed most of all. His answer: Italian Sausage Parm. I’m from Maryland, not exactly know as a bastion of Italian cooking. However, I’ve heard of eggplant parmesan, chicken parmesan, and even veal parmesan. I also lived in New Orleans, which has a pretty extensive repertoire of putting fried things on sandwiches. I’ve eaten virtually every kind of po’ boy known to man. But this request stumped me. I really didn’t want to think of Italian sausage breaded and fried, slathered with cheese on a big Italian sub roll, so I didn’t ask. I just tried to think of something, well anything, that would be healthier, but still give him a sense of what he was missing. So, I needed a vehicle. I vehicle to replace the bread. It’s a tad early for summer squash and the poblano peppers at the store looked a little small. An eggplant boat seemed wrong. But, the green peppers were enormous. So, by default, the dish would be a form of stuffed pepper!! With the pepper part of the dish covered, I wanted to add sautéed mushrooms and onions, tomato sauce, melted cheese and Italian sausage. Combined, they should give a pretty good approximation of the Italian Sausage parm sandwich. And, to quote the hubs, it was. I don’t really think of this as a “recipe”. You don’t like onions? Don’t add them. Want to make your own marinara or tomato sauce? Go ahead. Want spicy sausage vs. mild. Fine by me. Pretty much cook your “stuffing”, hollow out the pepper, stuff it and top with cheese. Whether that qualifies as a “recipe”, I’m sort of torn. 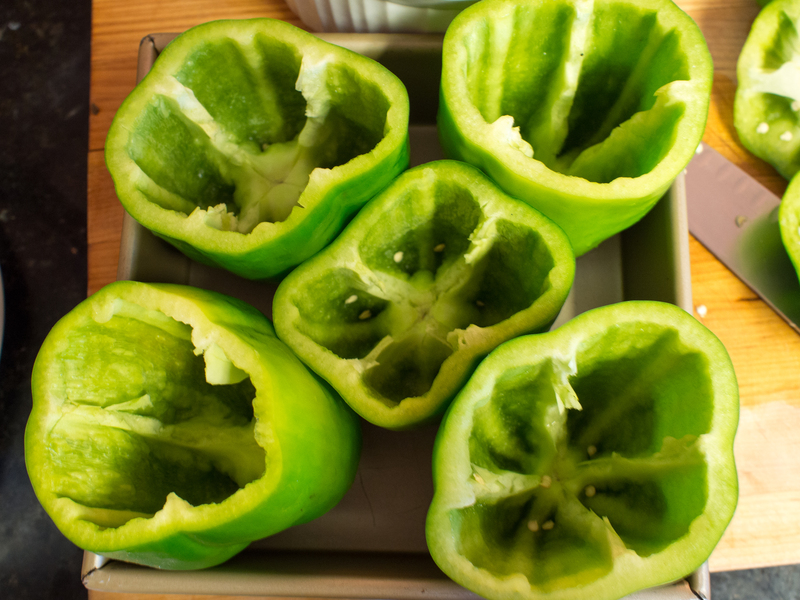 Cut the tops off of the green peppers, and remove the seed core and any soft white parts. Place in an oven safe baking dish and set aside. 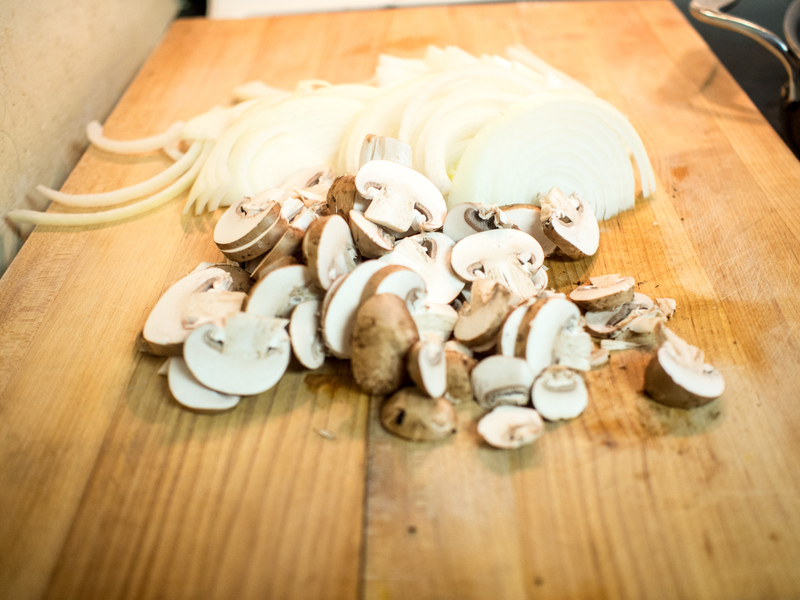 In a pan suitable for sautéing onions and mushrooms, heat 1/4 cup of the oil over medium heat. 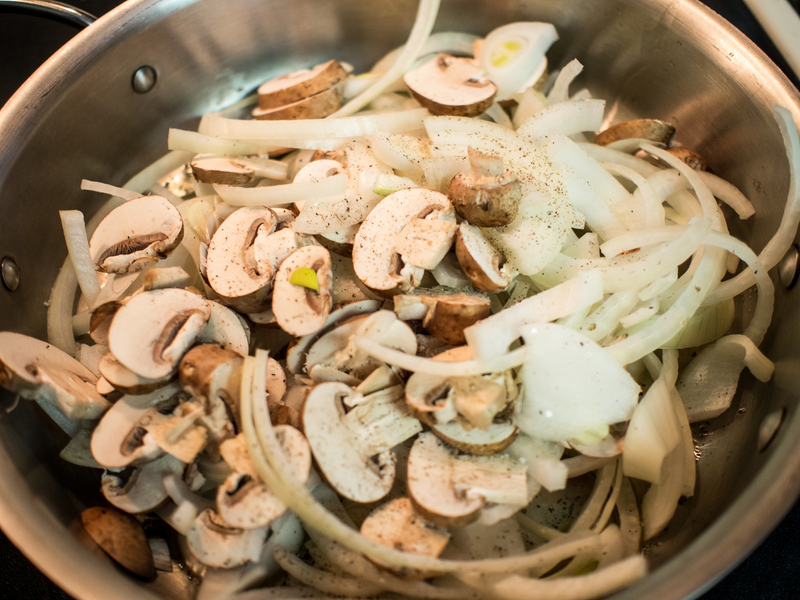 Once heated, add the onions, mushrooms and salt and pepper. Cook until the onions and mushrooms are very soft, about 10-15 minutes. Stirring occasionally. You may need to turn the heat down, as you do not want the onions to “brown” excessively. In a separate pan, heat the remaining 1/4 cup of olive oil over medium heat. 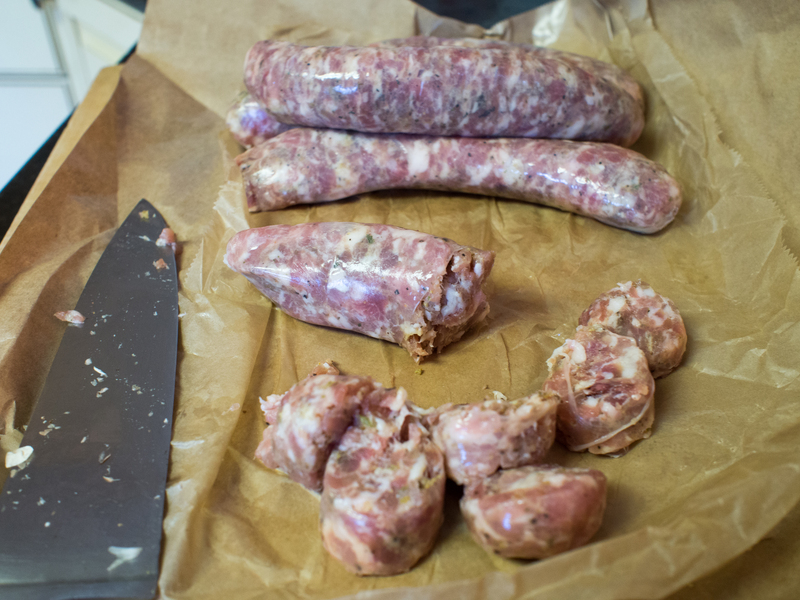 Slice the Italian sausage into rounds about an inch thick. Place into pan and sauté until cooked through, about 15 minutes. 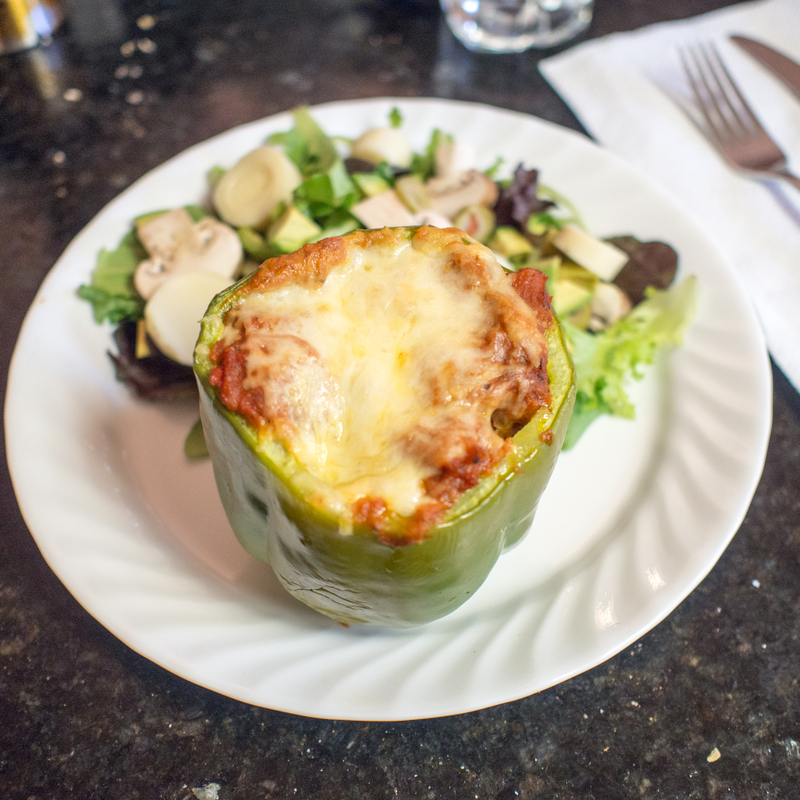 Layer the ingredients into the bell pepper as follows: onion and mushroom mixture, few tablespoons of tomato sauce, sausage rounds, and tomato sauce again. 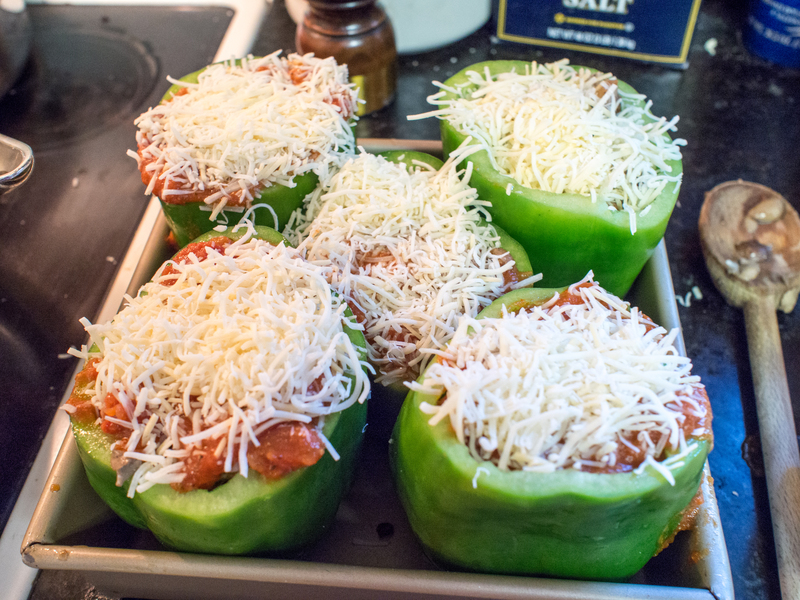 Top the pepper with cheese. 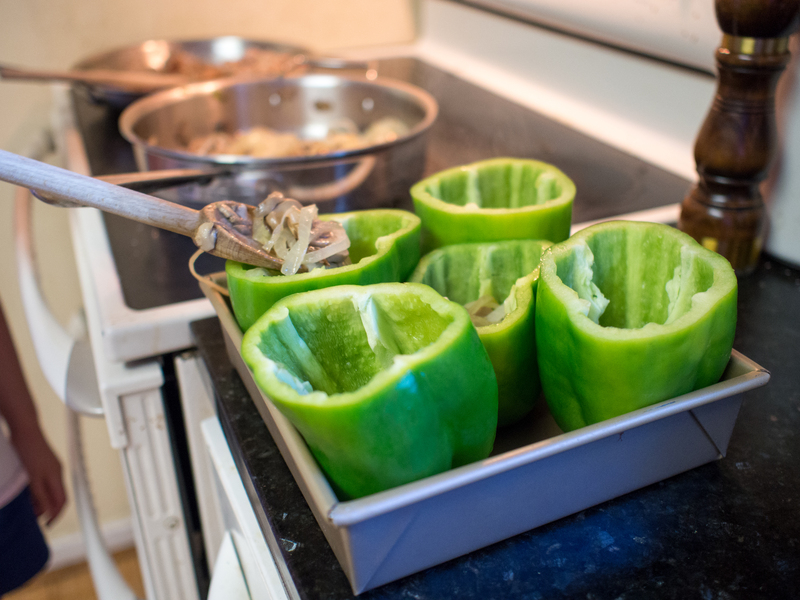 Place the stuffed peppers into the oven and bake until the peppers are soft about 45-60 minutes. This entry was posted in Gluten Free, Low(er) Carb, Main Dishes, Pork and tagged Gluten Free, Italian sausage, Low Carb, mozzarella, stuffed peppers, Tomato sauce on May 21, 2013 by dawn of food.